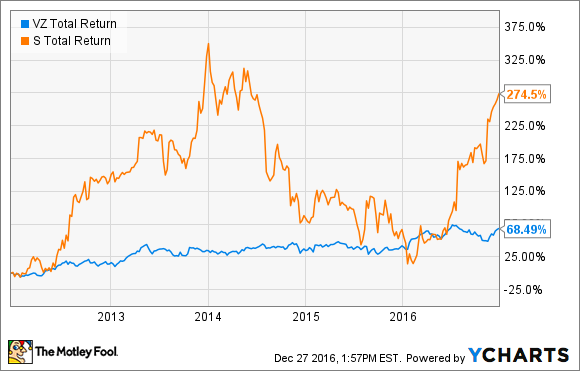 Stock Face-Off: Verizon Communications Inc. vs. Sprint Corp. It's the classic tale of David and Goliath, except that David's strongest weapon might be a $50 billion megamerger. At first glance, Sprint (NYSE:S) vs. Verizon Communications (NYSE:VZ) looks like a very simple, natural rivalry. Two of the four nationwide wireless networks, set up in a steel cage, do battle over traditional telecom metrics and issues, and a single survivor leaves the ring victorious. That's actually not how this rivalry works at all. How Much Bigger Is Verizon's Number? In short, Sprint can't hold a candle to Verizon's hugeness. In an industry where economies of scale play a deciding role, this is a massive business advantage for Big Red. The company can strike billion-dollar deals without breaking a sweat, take large business risks without betting the farm, and negotiate from a position of cash-backed strength. Meanwhile, Sprint nurses negative earnings and returns on equity under a crushing debt load. The company depends on capital injections from majority owner SoftBank just to keep its network upgrades and other business plans alive. And for the income investors out there, Verizon sports a generous 4.3% dividend yield while Sprint can't afford to spend any cash at all on dividend checks. Knockout in round one, right? Verizon must be the only reasonable choice, thanks to a dominant financial performance. Sprint investors have enjoyed a thrilling 138% return in 2016. Verizon shareholders had to settle for 16%, or 21% if you include reinvested dividend payments along the way. Market momentum is clearly on Sprint's side, and there are certainly plenty of buyers out there who see value in Sprint shares. Yes, more value than they see in Verizon's stock. In many ways, Sprint is a turnaround gamble. From the end of 2013 to the start of 2016, share prices had fallen a bloodcurdling 66%. The company is in the habit of reporting weak subscriber counts and even weaker bottom-line profits, and that hurts in the long run. This year's bounce rests on a firmer top line and smaller cash losses -- plus the tantalizing possibility of Sprint joining forces with T-Mobile US (NASDAQ:TMUS) to create a third megatelecom. Reports would have it that Sprint wants to buy T-Mobile in a deal financed by SoftBank cash. The Japanese company keeps inviting these rumors only to swat them away once the wild and woolly tales get going. In the latest round of this action, SoftBank CEO Masayoshi Son promised President-elect Donald Trump to invest $50 billion in the American market, raising the ghost of T-Mobile combination plans again. But the cash is reportedly meant for investment in smaller start-up businesses, not big-ticket buyouts. But that report's boost never faded from Sprint's stock chart, even after dismissing the direct buyout conclusion. VZ Total Return Price data by YCharts. So I can't give you a clear winner here -- only two investments aimed at completely different targets. Verizon is the obvious choice for income investors, and an equally obvious selection for those who prefer a predictable business with a low dose of risk. Sprint appeals to momentum gamblers, turnaround visionaries, and those who see a T-Mobile merger changing the American wireless market forever.